During this Year of Grace, we have been invited to revisit the constitutions of the Second Vatican Council, which began fifty years ago this year. The first of these constitutions was on the liturgy, Sacrosanctum Concilium. One of the most significant liturgical reforms of the past fifty years has been the translation of the liturgical texts into vernacular languages. 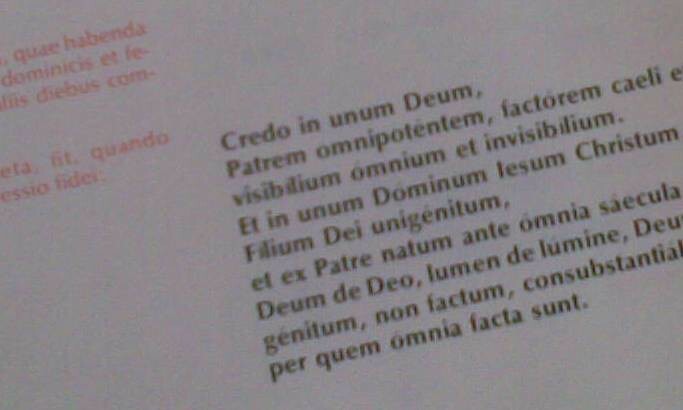 When addressing the matter of language, Sacrosanctum Concilium began by stating that Latin was to be preserved. It did go on, however to say that use of vernacular languages could be extended, as it could be of advantage to the people. It then stated that territorial authorities (such as the Australian Catholic Bishops Conference in our case) were to determine whether other languages were to be used and to what extent, which would then be confirmed by the Vatican. 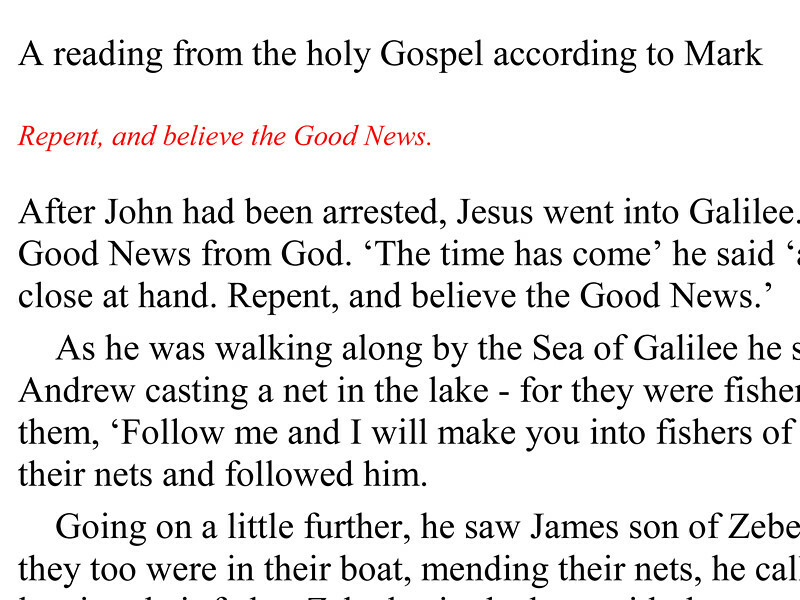 Bishops’ conferences would also be responsible for approving the translations that were to be used. The matter of language highlights the fact that the Constitution laid a foundation for the liturgical reforms that were to come, but that later work and documents would become necessary to “nut out the details”. Already in the past half a century, the Vatican has released two differing instructions on liturgical translations. In some cases, additional requirements have been added to what Sacrosanctum Concilium proposed. For example, English translations for the liturgy have to be approved not only by the local bishops’ conference, but reviewed by Vatican committee prior to approval by the Congregation for Divine Worship and the Discipline of the Sacraments. On Thursday, the Church marked the fiftieth anniversary of the opening of the Second Vatican Council. During this Year of Grace, we have been invited to revisit the constitutions of Vatican II. 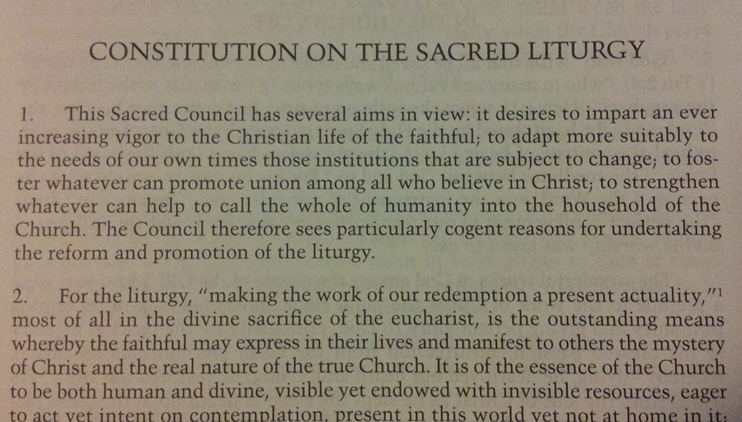 The first of these constitutions was on the liturgy, Sacrosanctum Concilium. After addressing general principles that were to underpin the constitution’s understanding of the liturgy, it began to articulate some general norms that were to be observed when implementing the liturgical reforms the constitution would subsequently propose. The first was that the liturgical rites were to be marked by a “noble simplicity”, that they be clear and generally comprehensible. It should not, for example, be necessary for there to regularly be lengthy explanations needed during a liturgical celebration for people to understand that is taking place. Another general principle was that of the importance of sacred scripture in liturgical celebrations. Sacrosanctum Concilium called for an increased use of a wider range of scripture texts. It emphasised the importance of good preaching, helping people to come to a better understanding of the scriptures and the liturgical rites. Finally, the constitution also encouraged an more frequent use of what it called “Bible services”, especially on more important occasions during the liturgical year, and in places and on occasions when a priest is not available. The constitution continued on naturally from the topic of participation to speak more specifically about liturgical ministry. It began by stating that any ordained or lay person fulfilling a ministerial role should undertake only the one role during a celebration, and undertake all the duties of that role. The importance of liturgical ministers as leaders of prayer was emphasised; that ministers should carry out their duties in an appropriate manner, and be properly formed and trained for their role. The constitution spoke strongly about the importance of participation. Participation in the liturgy was described not as something desirable or preferred, but as the right and duty of every baptised Christian. The constitution called for everyone to be led to this “full, conscious and active participation”. Participation in the liturgy was the goal to be “the aim to be considered before all else” when reforming and promoting the liturgy. The constitution also strongly called for people to be provided proper formation and study in liturgy, so that they could participate in celebrations as fully, consciously and actively as possible. This was a significant change in thought for many in the Church at the time, who often believed that the liturgy was the almost exclusive duty of the priest. In fact, the liturgy belongs to the entire Church, with each member of the Church participating in their own way. It unites us together as the Body of Christ. Every liturgical celebration is a public act of Christ and his Church, and is never to be considered a private function. While the liturgical changes that occurred after Vatican II appeared to be a significant departure from how the liturgy had been celebrated, they were not intended to be new innovations. Rather, they could be described more as going “back to the future”. Over the course of many years prior to Vatican II, increased research and scholarship within the Church saw it uncover and rediscover much more of its earliest history than it previously knew. The Church came to a greater understanding of how the liturgy was celebrated in the first few centuries. The accounts of saints and martyrs, the sermons of bishops, ancient missals, manuscripts and other artefacts helped the Church develop a clearer picture. 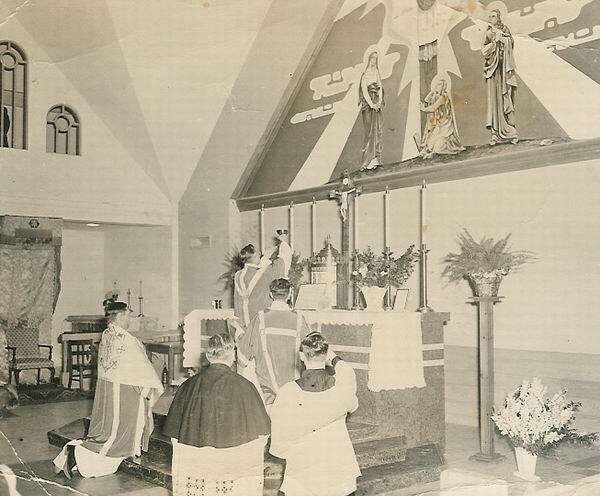 As such, when the Constitution of the Sacred Liturgy was developed and promulgated at the Second Vatican Council, it called for the Church to restore earlier liturgical practice, to draw upon the earliest traditions as the foundation for any liturgical reforms that were to take place. Some of those reforms were explicitly named in the constitution, while others grew out of the general principles that were provided. 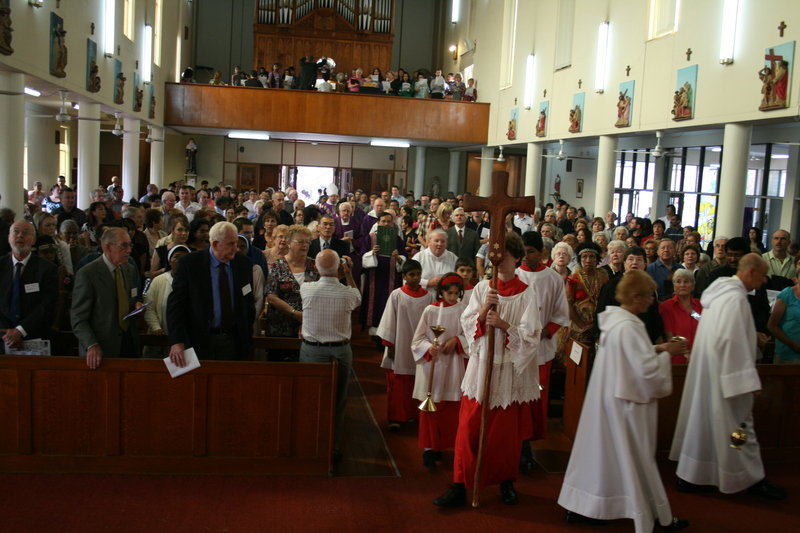 The increased participation of all the people in liturgical celebrations, the use of vernacular languages, increased use of scripture, and changes to the Christian initiation of children and adults are just some examples of reforms put forward in Sacrosanctum Concilium that find their origins not as new ideas of the twentieth century, but in the liturgical celebrations of the Church before it had even gained the approval of Emperor Constantine in the fourth century.